A vast number of people in developing countries depend on the natural environment for their livelihoods  on farmland or forests, wetlands or coastal areas. For these people, the environment is much more than a source of recreation  it is the basis of the economy. But poorly functioning markets, incomplete property rights, and misguided policies can drive peoples behaviour in ways that are rational in the short term or from an individuals point of view, but harmful to the environment and future generations. Economics has much to offer in understanding and influencing this behaviour. It also provides tools for decision-makers faced with difficult choices. How can we compare the value of environmental benefits to the costs of safeguarding them? How can we assess the impacts of environmental action (or inaction) on the poor? How should we share the costs of improvements? This book shows how researchers from four of IDRCs regional environmental economics networks have dealt with questions like these in a wide variety of situations in Asia, Africa, and Latin America. It brings together insights from more than 15 years of research and assesses their impact on policy and the research community. 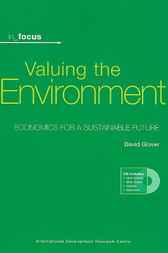 It concludes by looking at the future of environmental economics in the developing regions of the world.David Glover leads the Environmental Economics program at Canadas International Development Research Centre. He has worked at IDRC since 1982, first as director of Economic Policy and from 1993 to 2006 as founding director of the Economy and Environment Program for Southeast Asia. Dr Glover has a PhD in Political Economy from the University of Toronto and is the author of numerous publications dealing with environment, trade, and agricultural policy.